Industrial Automation System Warehouse Datalogging System for Pharmaceutical Company Our client has a large warehouse with 18 movable racks used for storage of finished goods.For quality of the stored goods, as well as regulatory purposes, it is required to measure and record the humidity and temperature at several points on each of the racks. The customer required continuous datalogging of the RH+T on a central server running a 21 CFR Part 11 compliant SCADA software, the calculation and display of the Mean Kinetic Temperature and an Industrial PC (IPC) on the shopfloor to permit local SCADA operation. Radix provided a turnkey solution, including installation, cable laying, etc. As manufacturers of the RH+T transmitters, the Automation System (including SCADA) as well as the control panel, Radix provided a highly integrated and cost-effective solution. Relative Humidity and Temperature (RH+T) transmitters (SC807) placed at 3 different points and heights in each rack. BMS System for Clean Room: Our client- a major manufacturer of pharmaceutical drugs, needed a Building Management System (BMS) to monitor the conditions of all areas and equipment of the facility. Adherence to strict conditions of the US FDA’s 21CFR Part11 within all units of the manufacturing facility is imperative in the production of pharmaceuticals drugs. Radix as manufacturers of sensors and as providers of SCADA solutions understood this need of our client and provided a turnkey solution.The BMS monitored all major units of the plants : manufacturing line, warehouse, packing, quality control.Radix provided Radix-make sensors (Hawkeye) to monitor and display humidity, pressure and temperature across all these units. The BMS also integrated utility equipment like air handling units and water systems. Our customer had a newly - constructed Greenhouse Automation / Humidity & Temperature Control (plant growth chamber) which required controlled temperature and humidity for optimal plant growth. 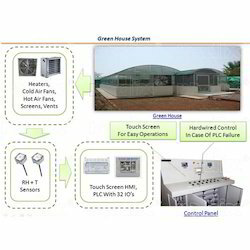 The customer desired to measure these parameters and control them with standard greenhouse machinery.To monitor these conditions, vital for plant growth, Radix placed temperature and relative humidity sensors inside and outside of our customer's plant growth chamber. These sensors were connected to a PLC which displayed parameters on an HMI and allowed operators to set necessary limits.Because control of relative humidity & temperature must be continuous, Radix built a 2-layer failsafe scheme to give operators hard-wired manual control of the plant growth chamber in case of PLC failure. Radix connected the operation of water pumps, heaters, hot and cold air fans, screens and vents to a system that allowed temperature and humidity to be controlled automatically or manually by operators. After successful automation of one plant growth chamber, the customer had Radix integrate two more for a total of 3.
rSCADA is Radix made SCADA is an integrated and full-featured SCADA software developed by Radix.It enables monitoring critical equipment parameters, 24/7 in real time and offline to generate instant notifications/alert or indication about any potential threats to prevent your system. rSCADA has been developed considering requirements of Pharmaceutical Industry.Compatibilty with the standards of 21CFR Part 11 makes rSCADA highly secure and reliable against any manupulation and tampering of data.Multiple successful US FDA inspections are testimony of our commitment to the latest regulations. 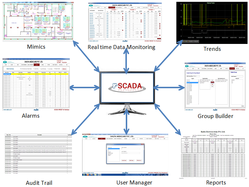 Specially designed 'Analytical reporting',rSCADA provides reports on hourly, daily and monthly basis for data analysis.It facilitates analysis by allowing user to customised reports on the fly and provides features like zoom, trim etc for detailed analysis. Designed to work as a completely plug and play system, rSCADA offers a fast turnaround time and ensures projects get completed on time, always.Its intutive user interface has been developed to reduce the learning time of the end users, thus drastically reducing training needs. Radix's experienced support team is available to solve any queries/issues faced by the customer. Powerful reporting engine - for data analysis by time, zone, machine etc. Comprehensive user management (create, delete, monitor,access) for different users. Servo-based Cut-to-Length System for Slicing Machine is provided to our client, an OEM of machinery for the adhesive manufacturing industry, needed a low-cost automation solution to accurately cut adhesive tape & increase the production rate of a slicing machine. The adhesive tape in its raw form is a long wrapped piece, which needs to be cut into standardized lengths. Manually performing this operation requires constant vigil of the operator, even more so if there are multiple standard lengths to be cut in a single pass of the slicing machine. Manual operation leads to errors and a slower rate of production. Radix provided an automated solution for the slicing machine incorporating features to cut multiple standard lengths and an easy-to-comprehend interface for the convenience of the operator. 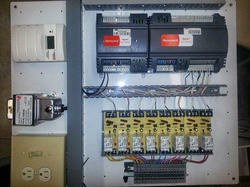 The system was servo-based with Delta Servo, PLC and HMI. Client required Screw Conveyor System Automation of a material handling unit comprising of 6 conveyors. Manual operation was resulting in loss of production and time as well as making it difficult to conduct root cause analyses when troubleshooting. Automation of the conveyors had to allow sequential operation of the conveyors such that material flow was stable without any backlogs or blockages.Radix provided a single control system allowing sequential and individual ON-OFF control of the conveyors. By replacing the old relay panel with a PLC system, we provided a low maintenance solution that was easily integrated in their present set up. In addition, a mimic display system showed operators status & troublesome points in the system for quick and targeted response. Buzzer indicators are used to indicate manhandling of the doors and will not allow to do so. Door groups can be formed in 4/8 door interlocking system. User can program door groups using PC based utility through serial communication. Door locking time and opening time can also be set using utility. A no touch switch / touch keypad is provided at the entry side of each door for access. Cascading 2 Door interlock controller can let you add up to 16 Doors in one go. Four Digital Inputs (DI)are provided for emergency door opening(e.g. through output of fire alarm system, or manual emergency door open switch). Two Digital Outputs (DO) are provided, they are relay outputs, and can be used to operate hooter etc. Utilized in Pharma Industries, Formulation / API Laboratories / Clean room / Operation Theatre and elsewhere where pressure difference is maintained to a specific point. 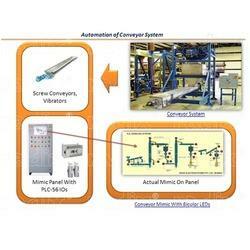 Looking for Automation Solutions ?